TORONTO, April 27, 2017 – Avanti Computer Systems Limited, a leading provider of Print MIS solutions, has unveiled its lineup of speakers, sponsors, and events for the 2017 Avanti User Group Conference, taking place May 23 – 26, in Denver, Colorado at the Grand Hyatt on their website: www.avantisystems.com/AUGC17. The education-rich conference features over 50 sessions about the Avanti Slingshot and Avanti Classic platforms, as well as industry vertical roundtables for Marketing Services Providers, Commercial Printers, Large/Grand Format, Print & Mail, and In-Plants. Avanti experts will also be on hand to answer questions in the “AskAvanti Experts” room throughout the entire conference. View the Avanti Slingshot Agenda, Abstracts and Speaker bios at avantisystems.com/AUGC17. This year’s platinum sponsor, Ricoh, will host an afternoon of education and roundtables at the Ricoh Customer Experience Center in Boulder, which will feature a variety of topics such as reporting, accounting, sales and marketing best practices, as well KPIs, workflow and 3rd-party integrations. The afternoon will be followed by a one-of-a-kind dining experience, The Taste of Boulder, where delegates will experience the flavors and wonders of downtown Boulder in this unique “dine-around”. Sponsors rounding out the 24th annual conference include: Kodak (Gold); MarcomCentral (Breaks); Infigo Software and NexTec (breakfast); Graphic Arts Magazine (media) as well as Blitzprint and Michigan Farm Bureau (print and mail). 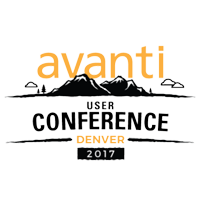 Visit avantisystems.com/AUGC17 for more information, or to register for the 2017 Avanti User Group Conference. #AUGC17.